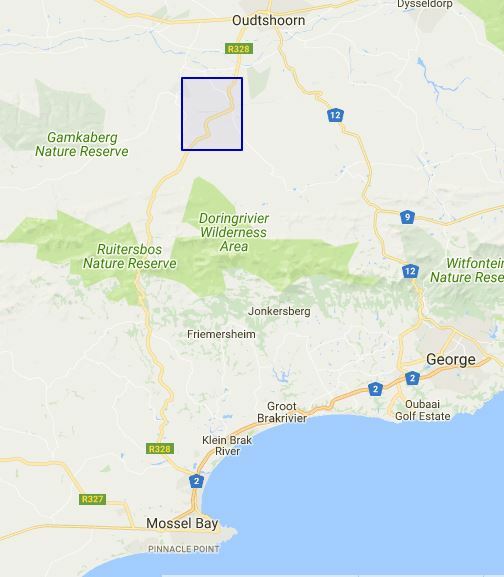 The Little Karoo (better known in South Africa by the Afrikaans name “Kleinkaroo”) is separated from the Great Karoo (“Grootkaroo”) by the Swartberg Mountain Range which runs east-west almost parallel to the southern coastline of South Africa, from which it is separated by another east-west range called the Outeniqua-Langeberg Mountains. The Karoo is a semi-desert natural region of SA, with low rainfall, arid air, cloudless skies and extremes of heat and cold. It was raining lightly when I set off early morning from Mossel Bay and the wet roads had me making my way very carefully up the twisty Robinson Pass, which peaks out at 860 m above sea level and typically has a thick layer of mist or low clouds in the upper parts, as it did today. Cresting the pass I glanced at the car’s temperature gauge which showed a chilly 5°C, so I welcomed the warmth of the car’s heater, but knew that I would be feeling it once I started atlasing, which one can only effectively do with the car’s windows open in order to be able to hear the birds calling, often the only way of identifying the species if you don’t see them. It was hard to imagine though, that the temperature would be the same 5° C on my way back through the pass at around 1.30 pm that afternoon! 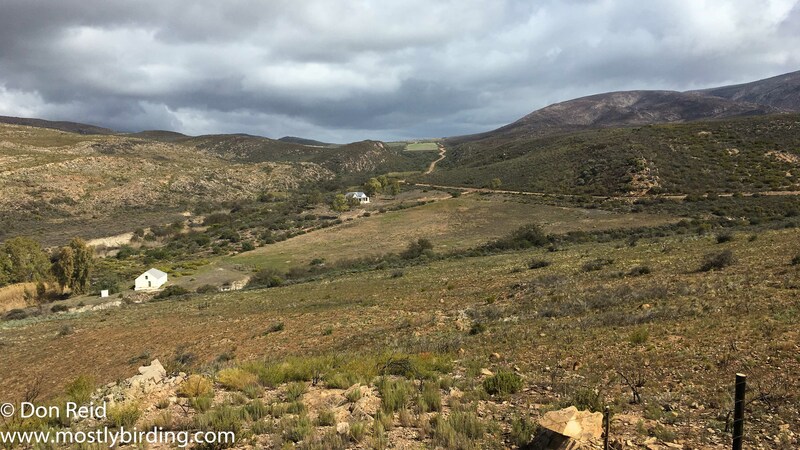 By 7 am I was through the pass and the habitat changed rapidly to that of typical Little Karoo – few trees, many small shrubs and bushes and not much else. 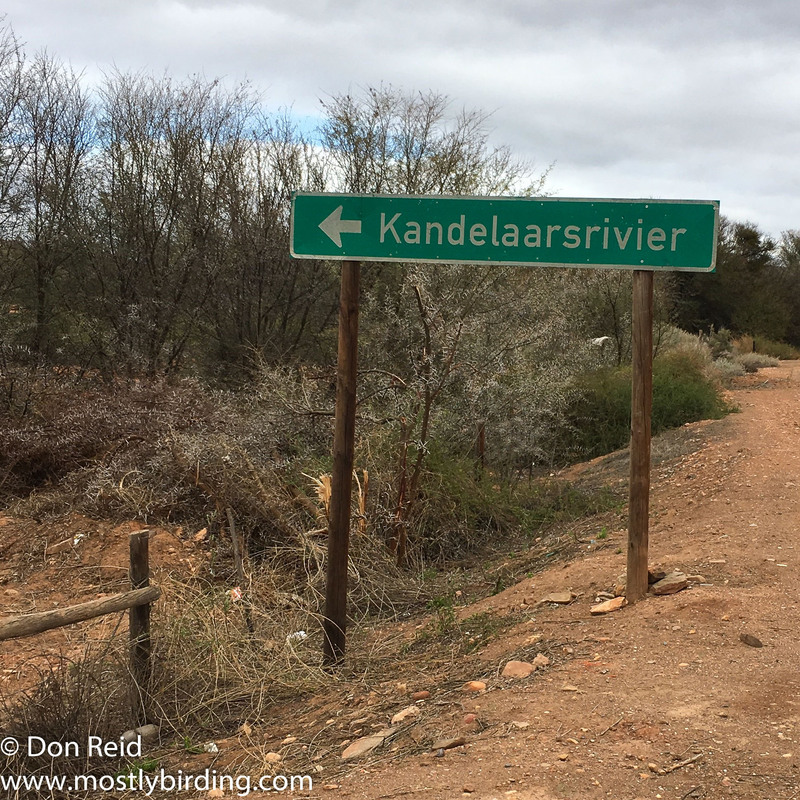 Compared to other parts of the country, birding in the Karoo is slow and measured but immensely rewarding at the same time. 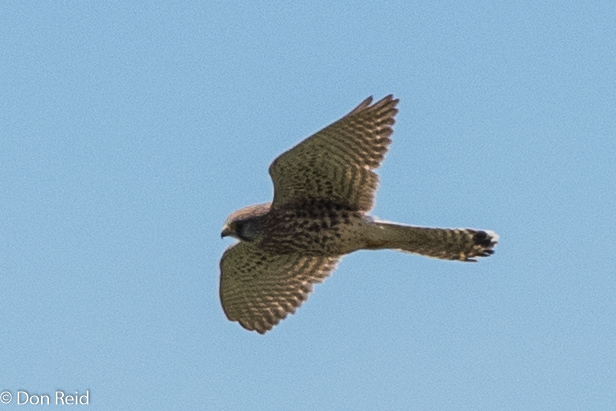 When birds are scarce there is a certain pleasure in looking for and finding whatever may cross your path, very different from the abundant birds that other more bird-friendly habitats may provide. It’s a bit like sipping a special wine, taking your time and appreciating each drop, knowing there’s a limited amount and plenty of time. A Karoo Lark (Karoolewerik ; Calendulauda albescens) drew my attention at my first stop, calling from a fence post then dropping to the ground. Its call was bright and cheerful despite the rather gloomy weather, but I suppose when you live in an arid area such as the Karoo, a bit of rainy weather is worth singing about! A gravel side road, signposted Kandelaarsrivier proved to be an interesting diversion and I followed it for a few kms not far from the mostly dry river course and past several farmsteads. Along the way I came across a group of Mountain Wheatears (Bergwagter / Oenanthe monticola) which were quite accommodating, allowing a close approach in my vehicle for some pleasing photos of this species which is usually at a distance. Both Speckled and White-backed Mousebirds (Gevlekte en Witkruismuisvoëls / Colius striatus and Colius colius) showed themselves at a spot further on – it’s interesting how they sometimes seem to stick close together yet don’t occupy the same tree. 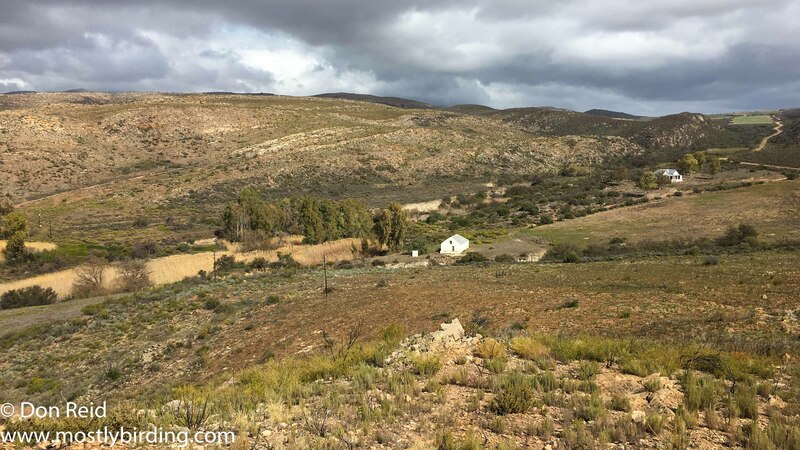 I continued along the back roads past small villages and settlements, stopping to have a closer look at a handsome stone country church and exploring a side road which looked interesting but only took me to a rugby field, which could surely only be found in the Karoo – no grass, just a hard gravel surface. I had to wonder how they played such a physical game on this surface – they obviously breed some hard players in the area or they have very good medical care. At another farmstead a group of White-throated Canaries (Witkeelkanarie / Crithagra albogularis) was busily gathering seeds from the ground, possibly spilled or perhaps from a nearby tree. Once past the quarry I could stop and enjoy the peace of the surroundings again and soon added Cape Bunting (Rooivlerkstreepkoppie ; Emberiza capensis), Acacia Pied Barbet (Bonthoutkapper ; Tricholaema leucomelas)and Namaqua Warbler (Namakwalangstertjie ; Phragmacia substriata). Just before exiting the pentad Cape Crow (Swartkraai ; Corvus capensis)and Cape Spurfowl (Kaapse fisant ; (Pternistis capensis) were welcome additions. 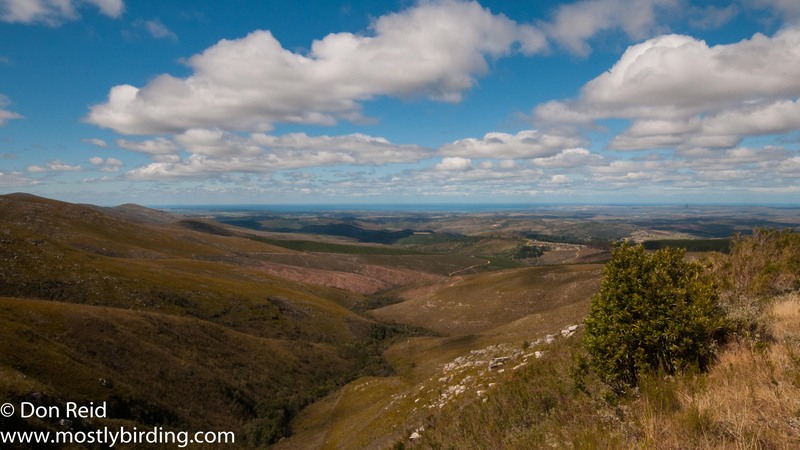 The landscape changed to more hilly country, providing some magnificent views…. 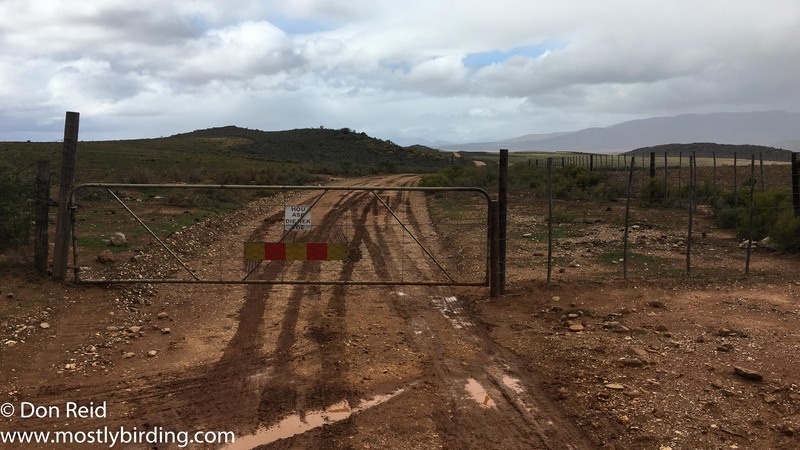 From there it was a question of finding the shortest route back to the main road to Mossel Bay, which turned out to be a “gated” road through rolling hills, necessitating the “stop, open gate, drive forward, stop, close gate” procedure repeated four times along the way. Not at all onerous when your travelling through such rugged and handsome countryside with no other vehicles to be seen, it just adds to the “getting away from it all” feeling. I eventually got back to the tar road at the Paardebont turn-off where I turned right onto the road back home. 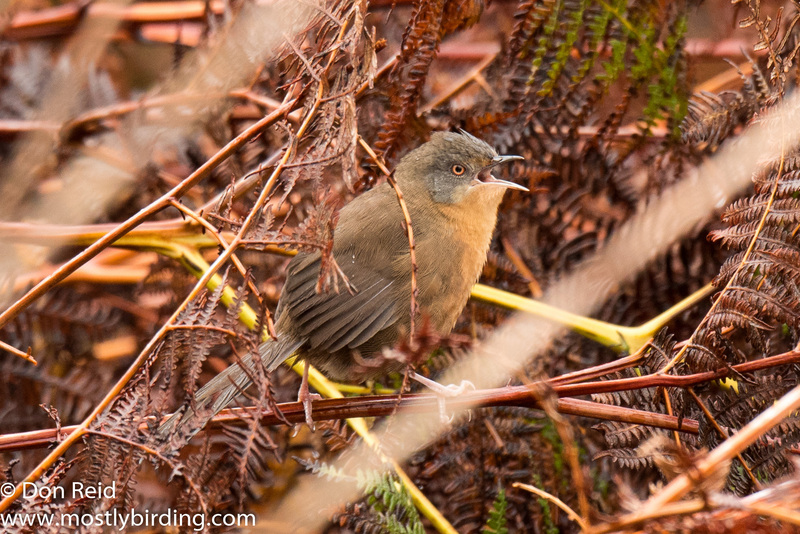 The day’s excitement wasn’t done yet however – heading down the Mossel Bay side of the Robinson Pass, I stopped at the roadside picnic spot where I had found my first Victorin’s Warbler (Rooiborsruigtesanger ; Cryptillas victorini) a few years ago – as luck would have it I almost immediately heard one in the bush just below the road and soon found it threading its way through the dense undergrowth which is their preferred habitat. After a couple of frustrating misses with my camera, I surmised which direction it was heading and went up ahead to wait for it to appear. This strategy worked as it briefly emerged from the bush and I rattled off a few shots while it called loudly. Eureka! I loved all the birds I got when I was In Kenya. Thanks for the map, it helped.